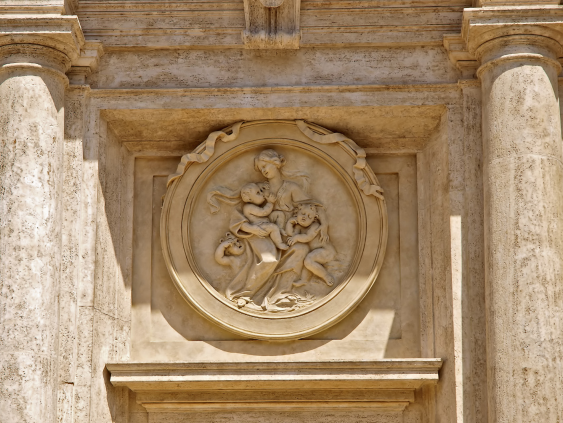 04/21/2017 | News, Presidential Address, World in WAIMH | von Klitzing, K.
Picture of mother and child in Roman architecture. Adobe Stock. It is with great pleasure that we – the World Association for Infant Mental Health (WAIMH) – announce that the 16th World Congress for Infant Mental Health will be held from 26 to 30 May 2018 in Rome, Italy. I cordially invite you take part in this exceptional event. Why should we take the road to Rome? Several historical figures have testified that Rome is worth visiting. Sigmund Freud, for example, visited Rome in 1897 for the first time after he had worked on his resistance in his self-analysis. After his stay he concluded in a letter to Fliess: “My trip to Rome was overwhelming, a highlight of my life.” Around one hundred years before that, Johann Wolfgang Goethe visited Rome not once but twice, and lived there for 15 months (between 1786 and 1788). He praised his stay in the eternal city: “Oh wie fühl ich in Rom mich so froh” (Oh, how happy I feel in Rome), in stark contrast to the way he felt facing the grey days of northern countries. And 275 years before that, in 1511, a young Augustinian monk named Martin Luther undertook a long pilgrimage from Germany to Rome to visit the city of the popes and martyrs. When entering the city he fell to his knees and exclaimed: “Sei gegrüsst, du heiliges Rom, wahrhaftig heilig..!” (Greetings, you holy Rome, truly holy…!). But years later when he looked back to his four weeks’ stay he described Rome as a “hotbed of sin”. What he saw in the city contributed to his urge to reform the Christian church. It has taken WAIMH 38 years, since it was founded, to come to Rome. I am sure that – like the examples mentioned earlier – WAIMH’s visit to Rome will be an amazing experience. I am convinced that all the participants in our world congress will find the visit to Rome will be worthwhile. I promise that it’s not just the wonderfully warm weather in May, the imposing antique monuments, the fantastic architecture from various epochs, and the world-famous Roman cuisine, that will delight you. The conference program, arranged by our Program Committee chaired by Kaija Puura, will be equally excellent. I call on scientists, clinicians, and infant mental health specialists all over the world to participate by submitting your proposals (abstracts) for the scientific program. Our friends from the Italian Association for Infant Mental Health (IAIMH), under the leadership of Giampaolo Nicolais, will be wonderful hosts and will connect our international participants with the regional, national and European tradition of early care and infant mental health work. It is said that all roads lead to Rome. The claim refers to the Milliarium Aureum, a monument erected by the Emperor Augustus in the central forum of ancient Rome. All roads were considered to begin at this monument, and all distances in the Roman Empire were measured relative to it. The meaning of the proverb is that many different routes can have the same intended goal. To a certain extent, this multi-finality also applies to the development of young children. Crosscultural studies show that very diverse conditions (different family structures, methods of care, parental ideals and attitudes, and socio-emotional conditions) can lead to positive developmental outcomes. But this multi-finality of developmental pathways does not imply complete arbitrariness. Just as we would never reach Rome if there were no roads, railway stations or airports, no infant can thrive without a caring environment to help them develop a trusting relationship to themselves and others. WAIMH has defined the basic conditions that are essential for infant development, such as sensitive caregiving relationships, nurturing, and legal protection; and in our position paper on the rights of infants (https://www.waimh.org) we advocate that these needs should be guaranteed as rights for all infants all over the world. As scientists, clinicians and infant mental health workers we must painfully acknowledge that the challenges to implementing this are immense. In many families and neighborhoods, violence, neglect and abuse are common. Many infants grow up in conditions of poverty, violent conflict, and war. Our host country Italy is situated in the centre of the worldwide refuge crisis. Millions of refugees, among them many young children, trying to flee poverty, war and persecution find themselves stranded on the Italian coast after a life-threatening trip across the Mediterranean Sea in leaky and dangerous boats. Not even the wealthy European countries, let alone the rest of the Western world, seem able to muster enough solidarity and support to take the pressure off Italy and help to distribute these stranded refugee families so that they have a chance of a life in human conditions. Clearly, this is not a road that leads to healthy child development. We, the WAIMH and the IAIMH board, have decided to highlight these problems, which jeopardize the development of so many infants, in central symposia and keynotes of our congress. I very much look forward to meeting you all in Rome in May 2018. I am sure that our conference will be a highlight not only of WAIMH’s history, but also of our personal and scientific lives. Don’t miss it!